China’s JinkoSolar has hit the US SunShot goal of sub 50c per watt solar modules, reporting a plus-silicon cost around 48 cents. Vertically integrated Chinese solar manufacturer JinkoSolar announced its “third straight quarter of profitability” along with net profitability for 2013 with a Q4 gross margin of 24.7 percent. Even some Chinese module makers are seeing good days return. First Solar recently reduced the cost of its cadmium telluride-based PV panels to 63 cents per watt, falling to 53 cents per watt in the fourth quarter of 2013 on its best line (excluding underutilization and upgrades). The U.S. DOE SunShot Initiative, which has the aim of reducing the all-in cost of solar power to less than $1 per watt, counts on module costs of less than 50 cents per watt. Prof. Mike McGehee of Stanford University doesn’t hold the view that silicon can achieve these costs. In a lecture yesterday, he suggested that the true cost of silicon solar cells, when stripped of Chinese subsidies, is 85 cents per watt. Brad Mattson, the CEO of Siva Power, claims that the prices put forth by Mehta are “completely unsustainable,” based on his conversations with Chinese solar CEOs. Mattson’s estimates of silicon solar costs are close to those of McGehee. 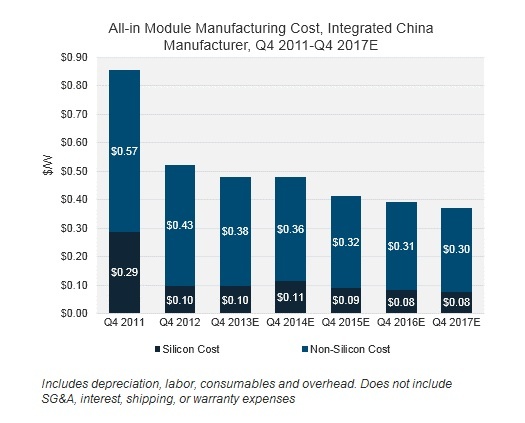 SolarWorld is making the case that Chinese solar module manufacturers receive unfair subsidies and sell product below cost in the U.S.
Jinko suggests that the European PV market in 2013 fell from 17 gigawatts to between 10 gigawatts and 11 gigawatts in 2013. In Q4, total solar product shipments were 586 megawatts, a new record, an increase of 13 percent from Q3 and almost double that of Q3 2012. Total revenues in the fourth quarter of 2013 were $361.4 million, an increase of 11.5 percent sequentially and an increase of 87.5 percent year-over-year. Income in the fourth quarter of 2013 was $43.3 million, compared with loss from operations of $117.8 million in the fourth quarter of 2012. Total revenues for the full year 2013 were $1.17 billion, an increase of 47.6 percent from $769.6 million in 2012. Income from operations for the full year 2013 was $106.6 million, compared with a loss from operations of $198 million for the full year 2012. For the first quarter of 2014, total solar module shipments were expected to be between 440 megawatts and 470 megawatts. For the full year 2014, total solar module shipments are expected to be in a range of 2.3 gigawatts to 2.5 gigawatts. Want to cut electricity sector emissions by 40%? Garnaut slams Direct Action as "Martian beauty contest"
I was at Mike McGhee’s lecture, but how did you hear about it? Perhaps some of the discrepancy in opinion on $/W is accounting for the difference between cost and price. They did say their asp was $0.63/W. They also said that their overall cash flow was negative due to accounting for debt. The historical PV module $/W is price not cost. If the business is to be sustainable it has to be profitable. That means they have to pay off their loans and provide a return to investors. The current world average industry price seems to be generally understood as about $0.75/W, with prices in China being below this because of intense local competition. It also appears that there is still a lot of overcapacity and Zombie firms not paying off their loans. This would lead to a reasonable assumption that $0.75 represents a price point where there is a lot of downward pressure on profit. So Mike McGhee and NREL may be saying that with current costs, a healthy industry would need a $0.85 price point. My opinion is this is likely. Costs don’t just magically come down. It mostly comes from investment in new more efficient plant and equipment. There is the beginnings of such investment now with hope for next year being better. I’d bet on PV panel prices staying at current levels for several years as capacity comes in line with demand and lower costs are used to restore industry profitability.